For millennia we have been living off the same earthly wealth, and our collective memory of the world was based on only a little more than a quarter of the planet. We have conceived the future in ignorance of the reality of the oceans. It has become indispensable to broaden our field of consciousness in order to overcome the challenges that lie ahead. After crossing the gates of the sea and taking a fresh look at the origin of life on earth, I have since worked to create a link between the depths of the sea and the world on the surface. Malvina, a visual artist and underwater painter, paints submerged in scuba diving gear. A graduate of Fine Arts (DNSEP) degree (Superior National Diploma of Plastic Arts) and a certified diving instructor Padi (OWSI), she combines her skills to paint the underwater world which has been her favorite subject for over twenty years. La Queue de la Baleine (The Whale’s Tail) represent a non-verbal language, the perfect image of harmony between nature and human with a sense of joy provided by the vital energy of cetacean. I chose as a vector the participatory performance of « La Queue de la Baleine », to create a universal work of art that will welcome thousands of people. We are currently 548 participants out of 1000. One thousand being the goal to reach for the first exhibition, before becoming a travelling performance around the world. Participate in the creation of a living and evolving work of art ! Each participant will receive his or her photo by email with the attribution number to the work given by order of arrival. 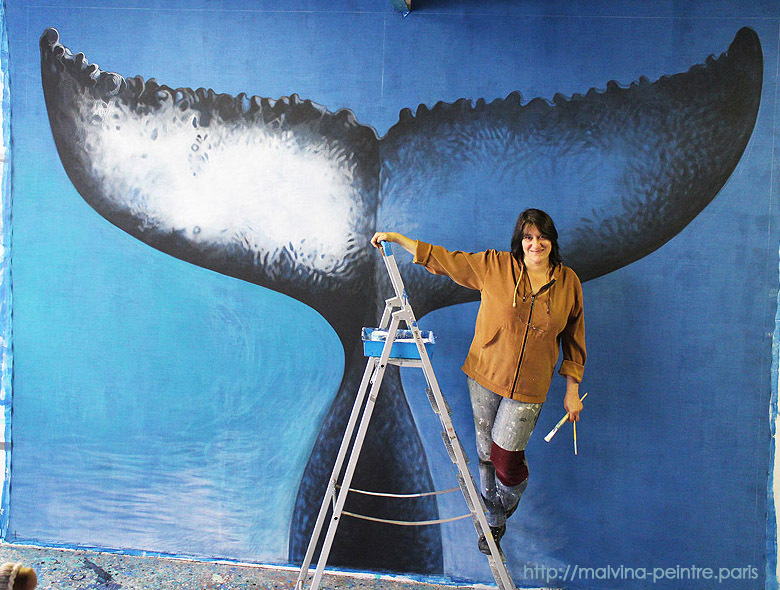 Participants are invited to pose for a photo shoot in front of « The Whale’s Tail » which is an acrylic painting, designed and created by Malvina on a 12m² linen canvas. The author proposes that the public pose with their arms wide open to express a desire to open up to the world and to life. The vocation of the work is to have thousands of people share in a sole action, while rendering the gesture of each, unique. Exhibitions will be organized throughout the trip and the participants will receive all an invitation in the private viewing. Posters and books will be published, retracing the history of the performance, which will be progressively enriched by the course of its journeys and meet. The friends of the whales will become the natural ambassadors of the oceans.